PA envoy to Brazil expresses hope that president-elect Jair Bolsonaro's pledge to relocate embassy to Jerusalem was simply campaign talk. The Palestinian Authority (PA) envoy to Brazil on Monday expressed hope that president-elect Jair Bolsonaro's pledge to relocate Brasilia's embassy in Israel to Jerusalem was simply campaign talk. Speaking to AFP, the envoy, Ibrahim Alzeben, said he would lobby the new government against the move. "Let's hope it's a campaign announcement. We are hoping that (the incoming government) will maintain Brazil's traditional position, respectful of the United Nations resolutions on the issue," said Alzeben. Bolsonaro announced via Twitter last Thursday that he intended to uphold his campaign promise and move the Brazilian embassy to Jerusalem. Prime Minister Binyamin Netanyahu later hailed Bolsonaro's announcement. "I congratulate my friend Brazilian President-Elect, Jair Bolsonaro, for his intention to move the Brazilian Embassy to Jerusalem, a historic, correct and exciting step!" he said. Alzeben, who has served as PA envoy to Brazil since 2008, dismissed as "premature" any notion of hardening the Palestinian tone with the incoming far-right government. Alzeben said from this week -- when Bolsonaro begins his transition to power -- the PA mission will intensify efforts to dissuade the new government from breaking with years of diplomatic tradition. Alzeben said he believes the decision can be reversed before Bolsonaro is sworn in. 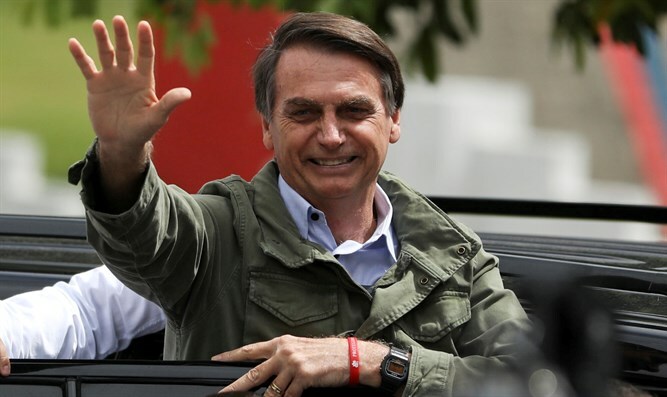 "We have two months for diplomacy to do its job," he told AFP, adding that his side was in touch with Bolsonaro's team over what he considered a "very important issue." "I doubt that the elected government does not want peace for that region," he added. Guatemala and Paraguay also moved their embassies to Jerusalem after the US relocation, though the Paraguayan President Mario Abdo Benitez recently reversed his predecessor’s decision and announced the embassy would move from Jerusalem back to Tel Aviv.